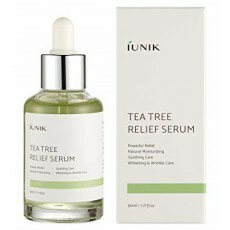 IUNIK Tea Tree Relief Serum is formulated to rescue sensitive and oily skin by providing powerful relief and soothing care on blemishes and bring moisture to skin that are oily outside but dry inside. The patented 6 fresh buds are rapeseed, brocolli, wheat, alfalfa, raddish and cabbage. Sprouted vegetable contains rich organic nutrients such as vitamins,minerals and enzymes to protect the skin from external harmful stimuli. After cleansing, toning and application of essences, apply adequate amount on the skin. Pat lightly for better absorption.